It’s a balmy evening in Barbados and I’m sitting face to face with Paul Carrick Brunson. Endorsed by Oprah, adored by tens of thousands of social media fans and now, by a group of Barbadian women who have just heard him speak on life, love and success. Paul, a mentor, entrepreneur and TV host, known for his matchmaking skills, is here as the keynote speaker at an inspirational event, Live Again: The Barbados Experience. The universe conspired for me to interview him for this post and I am beyond grateful! You’ll see why as you read on. MTV Buzzworthy called it B’Night. That’s exactly what it was for me. 150 minutes of my life I will never get back, spent watching Beyoncé on Saturday night prime-time TV. And I enjoyed every second of it. Until last night, the inner workings of Beyoncé’s life were pretty much a mystery. Fans, for so many years, have had to put the pieces together, based on what the media fed them–and what little Mrs. Carter would let them know. That’s why “Oprah’s Next Chapter” on OWN to “Life Is But A Dream” on HBO were so monumental. The entertainer, mother and fashion icon the world has fallen in love with, finally fed our curiosity. The man behind Oprah’s hair has landed a new gig. Serena Williams Gives Oprah A Pedi! For a while now, Serena Williams has been hinting that she’s enrolled in nail technician school. On Monday, viewers of “The Oprah Show” got a sneak peek at what has got to be her biggest test to date–giving Oprah a pedicure. The talk show host shared meaningful advice with Serena on life, money and love. All well and good, but it hardly tops my fav moment of all–when Serena asks Oprah if she can add bling to her newly polished toes. Check out the vid for Oprah’s response, plus more! 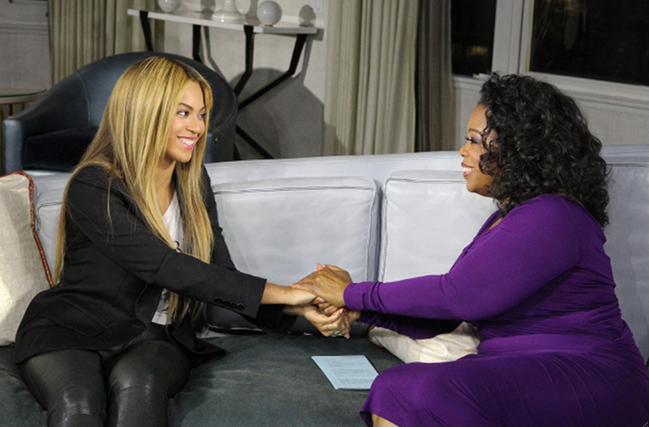 On Tuesday, May 4*, I’ll be tuned in to “The Oprah Winfrey Show” — no question about it! That’s the date supermodel Naomi Campbell joins Oprah for what sounds like a tell-all interview. According to an official release from the show, in the episode, Naomi reflects on her 25 years in fashion and comes clean about all the rumors, from her alleged temper to her new billionaire boyfriend. Hands down a must see! *Editor’s note: Although press release information from “The Oprah Winfrey Show” suggested a May 4 2010 air date, the Naomi Campbell interview was broadcast Tuesday, May 3 2010. It seems like everybody was either feeling like springtime or getting an early start on Earth Day celebrations. Either way, read more for pics of our favorite TV personalities, reporters and news anchors; they’re especially great for trendspotting and gathering intelligence on Spring/Summer style. It’s no secret that women everywhere are eagerly anticipating the launch of OWN: The Oprah Winfrey Network. Scheduled for a January 1, 2011 debut, the Network has announced 15 original series, with a few appearances from some of my fave icons in the world of fashion. Fashionista extraordinaire, Lady Gaga; super-fabulous photog, Annie Leibovitz; and fashion designer / Gucci reviver, Tom Ford will all appear in the one-hour weekly series. OWN is a joint venture between Oprah Winfrey and Discovery Communications and will debut in approximately 80 million homes on what is currently the Discovery Health Channel.